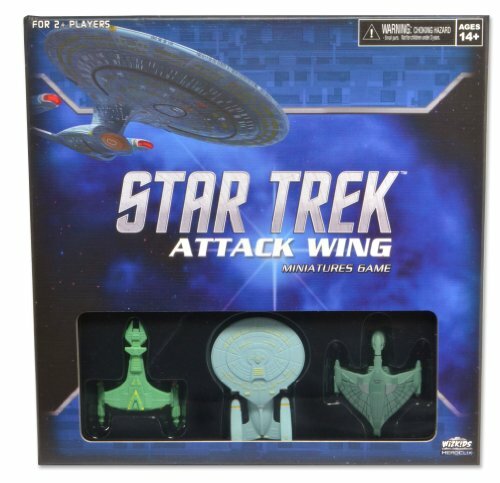 Star Trek Attack Wing Review — GamingWithSwag.com - Dads By Day, Gamers By Night. 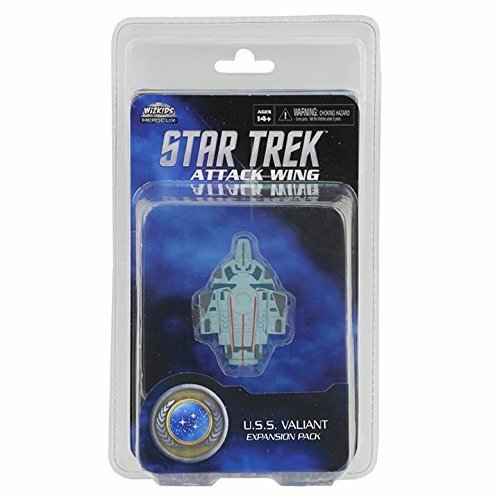 Star Trek: Attack Wing (or ST:AW for short) is a game I've been interested in for a while. I'm a long time fan of miniature games. There's something very satisfying about playing a wargame where you get to move pieces around a board that represent troops in more then just an abstract pile of chits way. I'm also a person who grew up on Star Trek: The Next Generation and saw watched many a Star Trek film during my formative years. So with all this in mind you may be wondering why it's taken me so long to try this one out?There are a few reasons but the most important one is that a few people told me this game is a pale comparison to the Star Wars: X-Wing Miniatures game. Wizkids did indeed license the same system that game uses for this one, but is it fair to just dismiss this because it's similar to another game? Lets find out! ST:AW has two or more players choosing a faction, spending points to buy ships/crew/upgrades, and then battling it out in either a specific mission or just an all-out brawl to wipe out everyone else's ship. Each turn is played out in four phases. In the first phase, planning, player's secretly select how each of their ships will move using a custom dial that has all of that ships possible movements. This is followed by the activation phase, where players, in ascending order of each ship captain's skill, reveal their dials, move their ships, then perform an action for each ship. Movement is done using a variety ofmaneuver templates that do all the measure for you, no tape measure required. The actions are various special commands such as scan, cloak, and target lock that give that ship an advantage in combat that turn. Next up is the combat phase where ships attack in descending captain skill order using special combat and defense die. Players have a combination of shield and hull points and when both are gone, the ship goes boom. The turn finishes with an end phase where players get back disabled shield tokens and take care of various other “clean up” affects. Then you repeat until one side completes the mission or destroys everyone else. For a game that is pretty simple to learn, the rules are pleasantly filled with detail. There are A LOT of pictures and examples that do a great job explaining the little details. In addition to all of this, they include what I consider the most often neglected yet most important element of a rulebook, the index. Seriously, game companies put a simple page index in your rules! It's also worth mentioning that there is also a four page quick start guide in the box, which I didn't find necessary, but is still nice to see. Here is yet another winning category! The game really evokes a feel of star ship battles, with each faction feeling unique and true to the faction they represent. Little touches, like the Romulan ships being more maneuverable and the Klingons having warriors they can beam on to other ships, go a long way to adding flavor. There is, however, an elephant on the bridge when it comes to theme, and that is scale. When I heard about this game the one thing people complained about the most (other then “It's not Star Wars”), was that the scale was wrong. In the world of Star Trek ships can vary pretty greatly in size but here they are all roughly the same. For me though I would say this is not as big a problem as others make it out to be. I have no problem playing board games where whole armies are represented by a couple pieces, so a little bit of abstraction in size here is easy to overlook, but it's still worth mentioning. 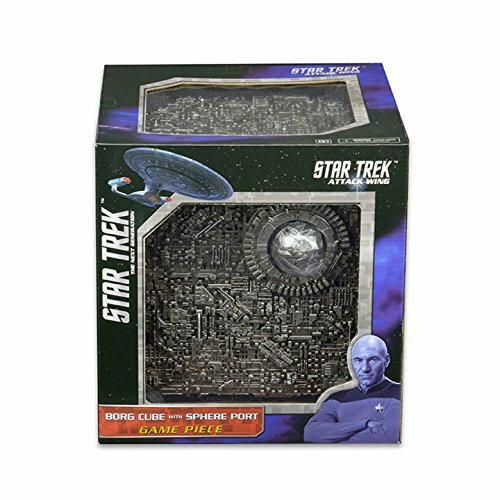 It did lead them to release a giant sized Borg ship which is impressive in person. Being a long time Warhammer 40k player, I'm used to games where you need to set up a large amount of 3-D terrain. With that in mind playing a miniatures game that only requires you to put down some cardboard planets, pick some cards, and set your ships down is very refreshing. The most complicated part of set up is deciding whether or not you want to put down a black table cloth before you start. The ships look decent but don't really pop for me. In Wizkids' defense though they have started reprinting old ships with new paints that really make the details stand out, so they are aware of the issue and working to make future ships look better. The other components are fantastic. The cardboard on all the counters are very sturdy, the custom dice look really nice, and best of all they use screenshots from the show on the cards. For me, the components and theme really link up best when you use screen shots rather then art.